The most expensive college degree is the one which is never used and indeed a great deal of the issues with college debt can be traced to unfinished degrees. Both of these issues are symptoms of the fact that the current system for career discovery is completely inadequate for the task at hand. The starting point is students who have been segregated from the rest of society in the K-12 system. The academic support function (teachers and guidance counselor) cannot help much because academics have limited engagement with industry. Thus, for most students, their career choices are often driven by their view of the range of professions from popular media. Unfortunately, only the professions with drama tend to be highlighted, so the vast majority are invisible to students. Before the internet revolution, it was very difficult to impact this situation. 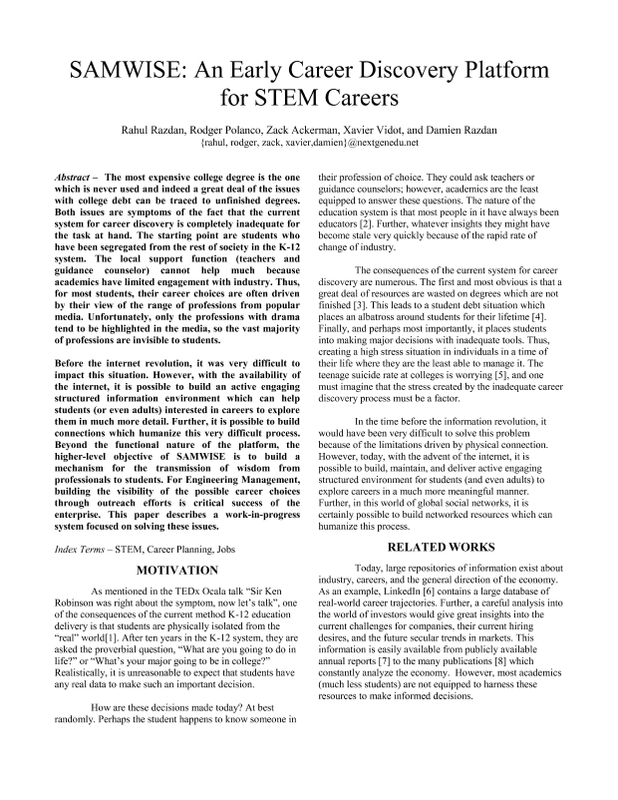 However, with the availability of the internet, it is possible to build an active engaging structured information environment which can help students (or even adults) interested in careers to explore them in much more detail. Further, it is possible to build connections which humanize this very difficult process. Beyond the functional nature of the platform, the higher level objectives of SAMWISE are to allow the transmission of wisdom from professionals to students.